Will Italian politics ever change? Italy has yet another new Prime Minister. Does this mean that Italian politics is changing? Will Matteo Renzi, an unelected Prime Minister, bring about the structural changes that the Italian economy needs so badly to give this fascinating country a much- needed economic renaissance? The problem with Italian politics is not just related to a weak electoral law that in the last few years delivered weak governments unable to bring about the changes needed for an economic revival. Not unlike what is happening in other EU countries, the present crop of political leaders in the various Italian parties lack the skills and charisma needed to pull their countries out of the present economic and social quagmire. The Italian right continues to be dominated by a convicted tax dodger who is suspended from serving in Parliament, but still leads a party that now has a good chance of being the biggest party in Italy and thus steer the country for five years. Many wonder whether this leader of the right is likely to do what he failed to do in the last 20 years – modernise the Italian economy and tackle the bureaucracy that stifles entrepreneurship. The centre-left leadership is not much more inspiring. The Democratic Party may have had more decent political leaders but they all lacked the charisma and steely determination to tackle the structural issues which Italy badly needs. Even capable moderates like Romano Prodi found it difficult to lead the country out of the economic wilderness because of the intrigue that permeates Italian political life that at times even leads to politicians crossing the floor of Parliament to achieve personal gains. The emergence of a young charismatic political leader has received mixed reactions from ordinary Italians, most of whom are fed up with the present system. A left-leaning lady interviewed by the BBC says she has given up on hoping that anything will ever change for the better in Italian politics: “Renzi is another Berlusconi. I do not expect any change for the better from him”. 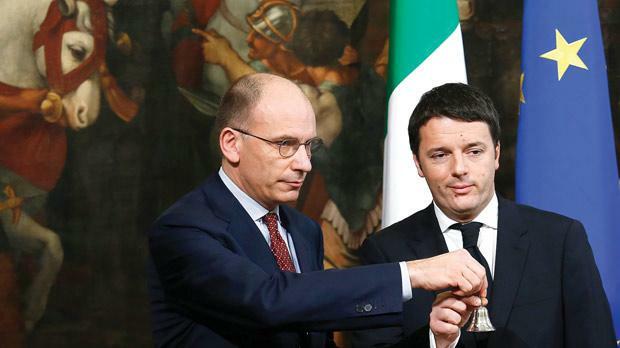 Others have compared Renzi to another Florentine, Niccolò Machiavelli, who knew a thing or two about politics. The Financial Times compared the way that Renzi took over power in the Democratic Party to a “Soviet politburo ousting”, casting doubt on this young man’s ability to find the backing for economic reform that he so badly needs in a fragmented Parliament. Cynics do not criticise Renzi so much for his political inexperience as for his cold calculations. With opinion polls pointing to yet another possible resurrection of the Lazarus of Italian politics, Silvio Berlusconi, the new Prime Minister knew that his best chance of achieving his political aim was to avoid immediate elections. He now has a chance to have a go at managing the country to show that he is indeed different from his predecessors. Renzi likes to think of himself as the Tony Blair of Italian politics. But certain sections of the European media have compared him to less flattering personalities. Some British journalists have labelled him as The Fonz, partly because of his striking resemblance to Fonzie – a fictional character played by Henry Winkler in the 1970s American sitcom Happy Days – and partly because of the way he projects himself as a cool fixer of problems. Having a strong personality is vital in politics. Ordinary people hate dull colourless political leaders even if their vision is the right one for their country. Mario Monti was one such leader who entered politics very late in life after having been a very successful EU Commissioner and economist. Italy has produced some excellent academics like Monti and the ECB president Mario Draghi, but when it comes to politics such people are regarded with great suspicion and envy by a large part of the electorate and the political class. So has Renzi the necessary qualities to deliver change or is he going to be burnt too early? With many in his own party wishing to see him lose because of his brash character, and the Italian public in its majority unimpressed by the way he assumed power, his honeymoon may be quite short.